This is a picture of Class 2 at St Mark’s C of E Junior School Arundel Road in 1965. 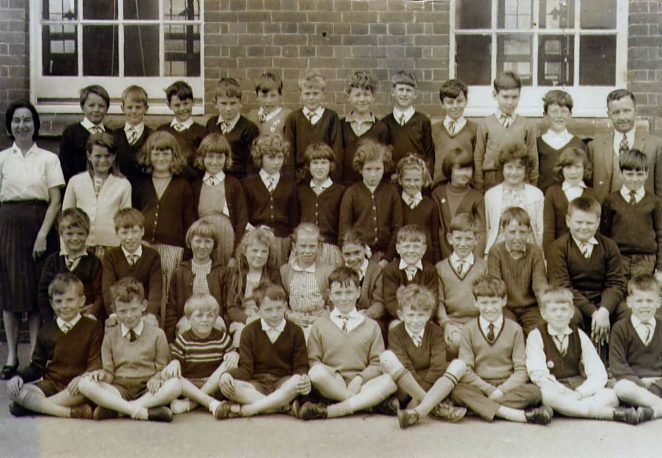 There are some of the pupils from the earlier posted 1967 picture, plus a few different faces. Sorry once again for the spellings of the names, hopefully someone can remember the names I can’t. Peter Arnold, John Clark, Ross Tyson, Nicholas Verrall, Unknown, Andrew McCrae, Raymond Tann, Paul Denyer, Charles Moore, Stephen Rollings, David Smart, Mr Smith (headmaster). Miss Mahwinnie (Class 2 teacher), ***** Kennard, Claudia Hewett, ***** Green, Sally Cannall, Theresa Goble, Anne Taylor, Theresa Eason, Lesley Ward, Carol Kelly, Unknown. Nicholas Steer, Unknown, Shirley Wingrave, Glynis Powell, Iris Bell, Unknown, Dennis Wheeler, Paul Sabbage, Kelvin Holmes, Ian Hugget. Mark Hurst, Unknown, Adrian Perry, Unknown, Steven Newman, Stuart Chalmers, Stephen Tucknott, Michael Brittain, Oliver Cowl. If you can help with some of the missing names, please do leave a comment below. I think the girl between Iris and Dennis (3rd row) is Pamela Payne, ***** Kennard is Valerie, and ***** Green could be Theresa Bean (I’ll check with her brother who’s a neighbour of mine). Lesley – 2nd row – joined at the hip to Terri Eason! Hi Lesley, thanks for posting a comment. As soon as I saw the names you mentioned I remembered them; I had it in my mind that Theresa Bean was Theresa Green but I was sure it couldn’t be that name. I seem to remember you were good friends with Theresa Eason; you are still joined at the hip on the 1967 photo too. Kelvin Holmes is my brother. He emigrated to Australia about 30 years ago and has not been back since. He is in construction now but was taking tourists on coral diving trips over there. Hi Marina, I was good friends with your sister Julia when you lived in Manor Crescent. I remember Karen, Kelvin, Julia, yourself- is there one I’ve missed? I lived in Hervey Road. Give my regards to Julia. I think that’s me “front row, fourth from left” Kim Orzynski. I’ve got a feeling that is earlier than 1965, though; maybe 1961 which would make me 9 years old. I went to senior school with Oliver Cowl, not heard the name in many a year. If this pic was in 1965 then you’d all be about 9 years old. Kim, This photo is definitely 1965, I’m sitting in the front row. Ken, Oliver lived in St Georges Road, Kemp Town, he also had an older brother. His mum was a local schoolteacher. The last time I saw him, he was a mens’ hairdresser in Church Street, Brighton, but that was a few years ago now. Thanks Michael. Ollie a hairdresser yet he always had dead straight hair. I think he also had a younger sister who had long dark hair.